This is one of my all-time favorite desserts. 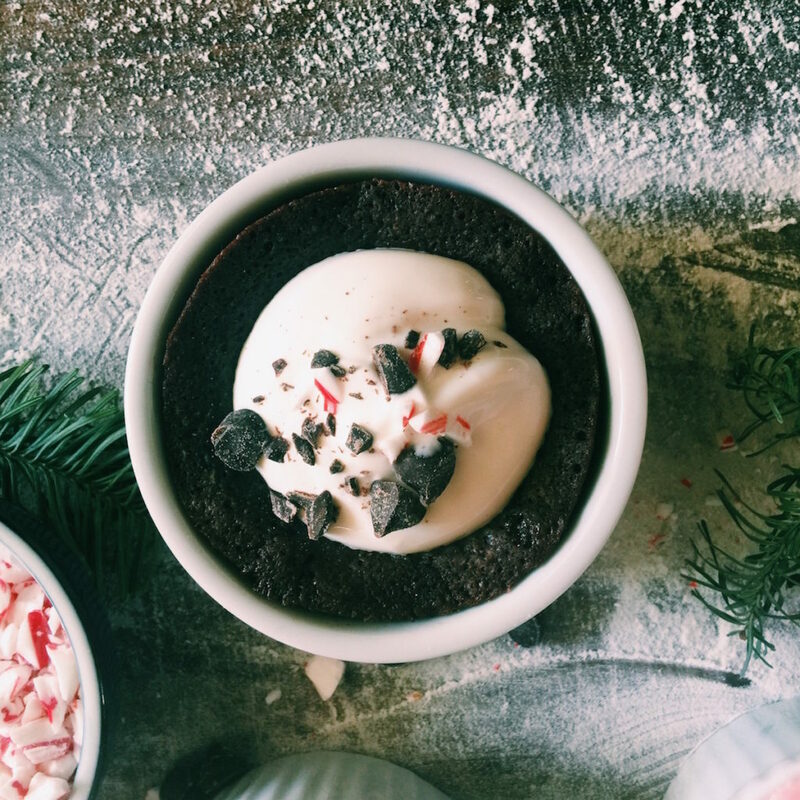 These chocolate pudding cakes are the base for any amazing dessert at any time of the year, but they pair especially well with this candy cane ice cream. This ice cream base recipe is a merger between the Barefoot Contessa’s and Ben & Jerry’s vanilla ice cream. I liked how the first uses all cream and the latter uses eggs. This stuff is creammmmmyyyyy. 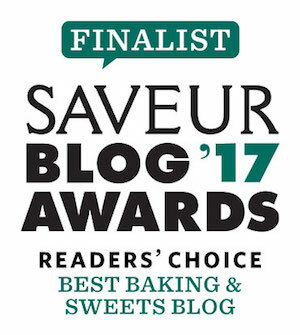 Sugar + fat are what make for a rich and luscious ice cream experience and this recipe has lots of both…because who are we kidding? We all give negative 25,000 shits about that right now. Trust me, the cold hard reality of January will come soon enough. Until then, bunker down, wear fat pants and eat treats. As promised, this is all make ahead…as in several days make ahead. Just make sure everything is sealed airtight and stored in the freezer (ice cream) and fridge (pudding cakes). One last note on the pudding cakes…this recipe is from Nigella Lawson’s book How to Eat. I wish you could see this page in my cookbook…it’s smeared with chocolate, falling out of the binding and the corners are torn. I’ve been making these since I was in college. If you love chocolate you’re going to lose your mind. I make a couple of almost too-insignificant changes to note, but I will anyway. I add salt (because it’s chocolate’s best friend) and vanilla (because they’re close cousins). 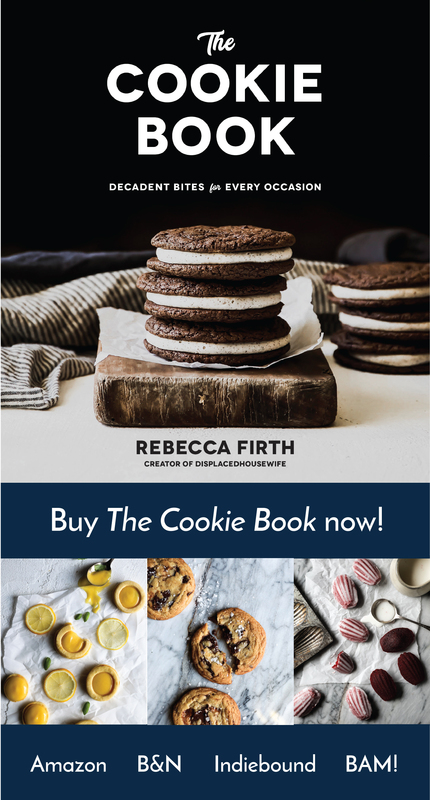 I can’t recommend this cookbook enough for anyone that loves to read cookbooks like books and not just as references for recipes. This is an oh-so-sweet dessert which is why I love that they are individually portioned out…it cuts back on overeating and seconds. Sometimes I need help in these areas. The warmth of the fresh-out-of-the oven ooey gooey cake instantly starts melting the ice cream…which is evident in my photos. I like to put ramekins full of fruit, mint, crème fraîche or whatever else sounds delicious out on the table so people can dress them up or down however they desire. In regards to planning, I made this amount of ice cream for a group of 13…but I would highly suggest doubling for anything over 8 people so that you don’t feel like you have to ration anything. 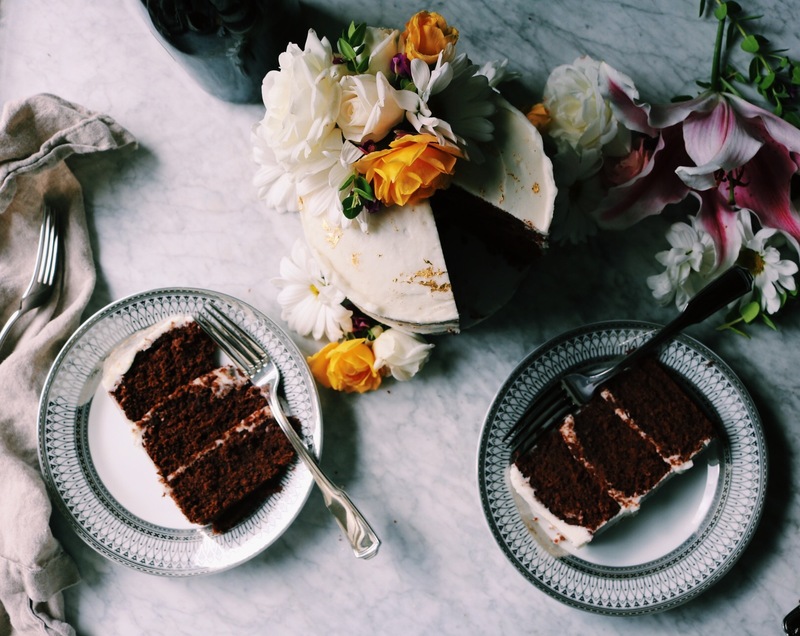 One last note…did you look at how few ingredients there are? It doesn’t get any more uncomplicated…unless of course if you don’t have an ice cream maker. If that’s your reality, it does take a hair more work. When we lived in Beijing I did not have an ice cream maker and I would get my ice cream base out of the freezer every 30 minutes (for about 5 hours) and use my handheld immersion blender to keep smoothing out the ice crystals. I’m just saying…it’s possible. I take my sweet game seriously. …these are so easy and delicious you’re gonna scream. Really. I also like to throw out some olives, bread sticks and nuts. Click here to see your Christmas week schedule so you get most everything done in the days leading up to Christmas Eve. All you’ll have to do that night is throw some ice in a glass and some pizzas at the oven and you’re done. Boom. Whisk together the heavy cream, sugar, eggs and vanilla. Whisk quite a bit until the mixture is smooth. **If you don’t want the uncooked egg in your ice cream, you can heat up your ice cream base and let it cool completely before proceeding. Then I put everything in the freezer while I get the ice cream maker set up so it can get an extra chill on. Once the ice cream maker is set up, I throw the creamy mixture in. It takes about 20 minutes in my maker to thicken. At which point, I throw in my crush candy canes and let it churn for another 5-ish minutes. Like I mentioned above, if you don’t have an ice cream maker you can use a handheld immersion blender and churn the ice cream with that every 30 minutes for about 5 hours. The key to that perfect ice cream texture is breaking up the ice crystals that are dying to form. Don’t let them. They must be squashed. **Quick ice cream maker tip…I have the Cuisinart with the open top…put a cutting board over it, trapping in the cool air, to make the ice cream freeze up faster. 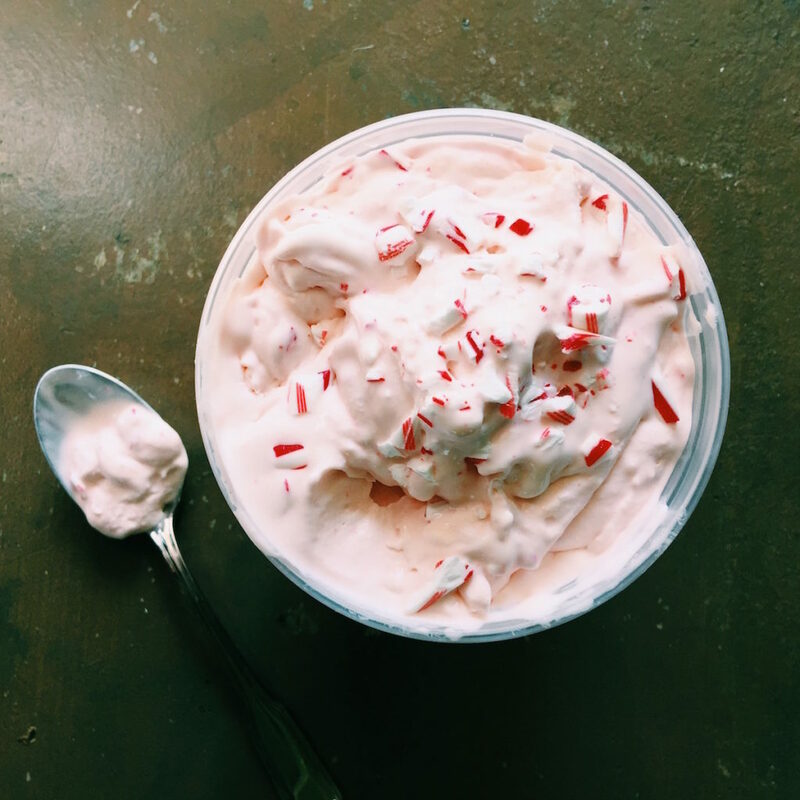 Put the candy cane ice cream in a quart container (have another container handy because I had some overflow) and shove in the darkest corner of the freezer where it can rest until you’re ready to eat. Butter and flour or spray with nonstick four ramekins (the size can be anywhere from 1 cup to 1/2 cup in size…you will use roughly 1/2 cup of batter in each ramekin). Set the ramekins on a baking sheet…this will make them easier to get in and out of the oven. Put the chopped chocolate and butter in a small, microwave-safe dish and put in the microwave on medium for 1 minute. Take it out and stir until all of the chunks are gone and set aside to cool a beat. In a medium bowl, whisk together the eggs, sugar, vanilla and salt. Slowly whisk in the butter-chocolate mixture. Once it is fully blended, fold in the flour until just combined. Bake for 10-12 minutes. You want the edges firmed up and the middle to be cooked, with a wee bit of wiggle jiggle happening. I prefer these undercooked rather than overcooked. They will be screaming hot when you get them out of the oven. Let them chill for about 5 minutes before serving. 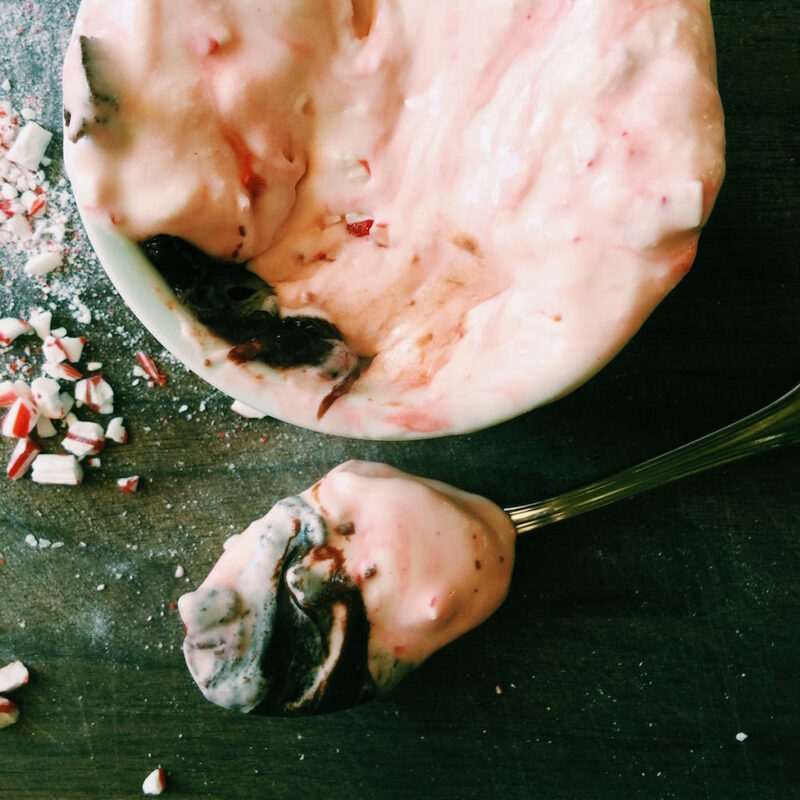 Scoop on the candy cane ice cream and watch them meld into one. It’s beautiful really. 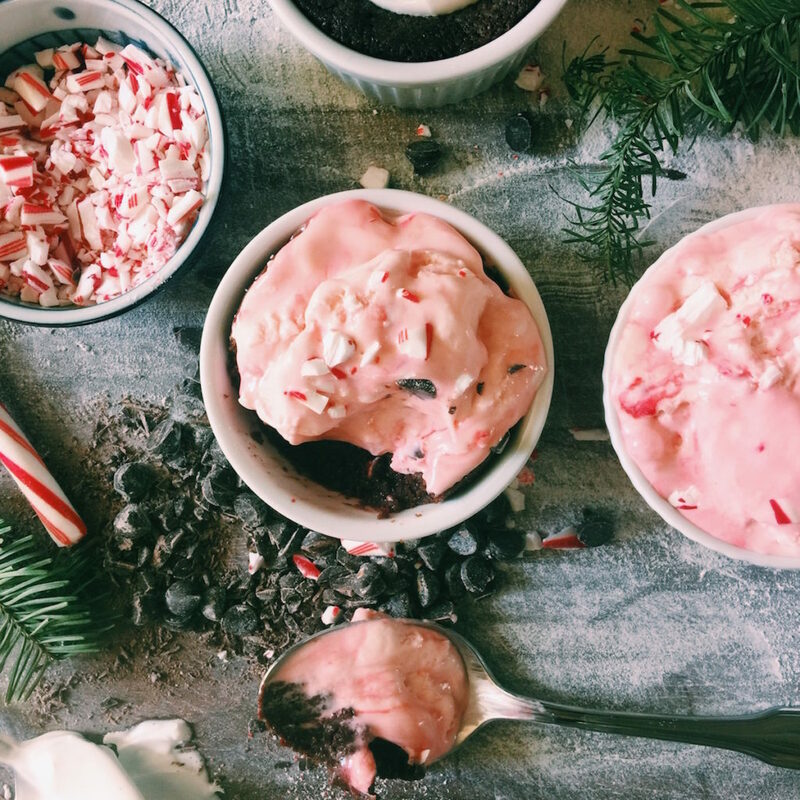 With your cocktail in one hand and a fistful of candy cane in the other, throw candy cane fragments on the tops and voilà. You’re done. You can officially check out for the night. We finally put lights on our tree. Yay. For your late-night reading pleasure, click here. Who knew. How are we doing with our Christmas planning? What can I help with? Are we all having fun and happy or stressed and manic? Both are totally acceptable this month. Chicken Talk: The difference between feeding three chickens and five is a lot. File that away in case you ever want chickens. I will be sending you several more emails in the next couple of days…I hope that’s ok. We have onion tarts, pizza and cocktails coming up all before Sunday…and then I may peace out for the holiday…we’ll see what kind of stamina I have after all of this. I’m now editing the FeedFeed’s Taco Feed…check it out here. Also, my Scone Feed is updated with some new beauties. You can’t beat a scone for holiday mornings because they freeze like a boss. Think about it. I also made these chocolate pudding cakes here…and paired them with a whisky sorbet…it’s boozy good fun. 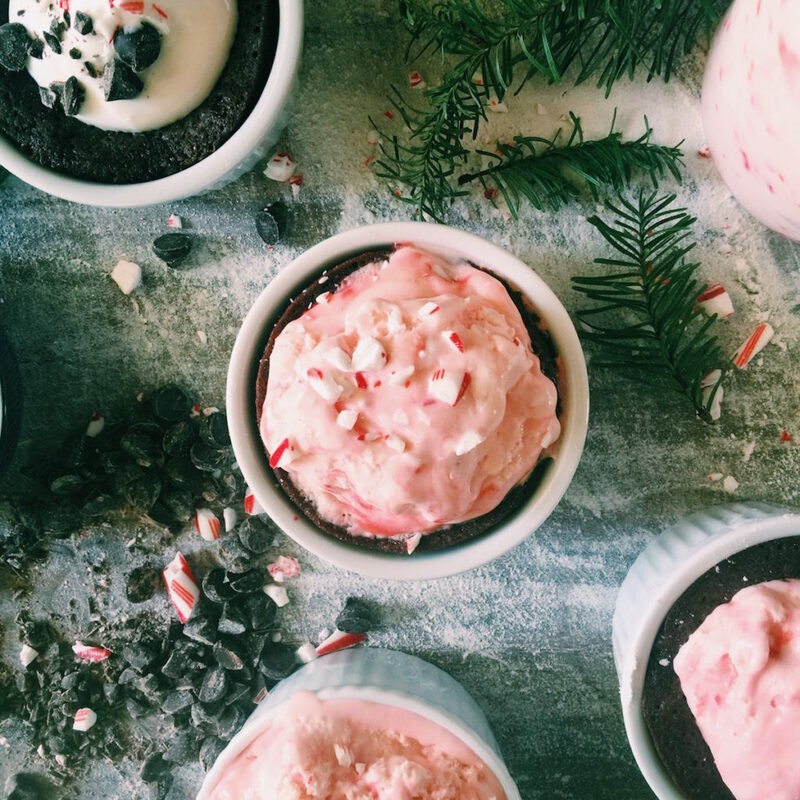 More holiday desserts to muse on: boozy sugared cranberry cheesecake, apple-cranberry rosette tarts, salted caramel pumpkin cheesecake, chocolate pudding cakes and amazeballs chocolate espresso cake.